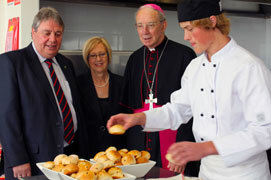 On Apr 26 Hobart's Archbishop Adrian Doyle blessed the latest training facility at Marist Regional College, Burnie, Tasmania. 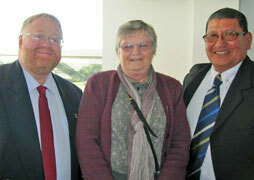 Local member for Braddon, Sid Sidebottom and Principal, Sue Chen, accompanied the archbishop and guests in inspecting the centre, formerly the common room for the founding Marist community of the college. Boasting a superb view of the Bass Strait, the Centre will soon feature its own restaurant, 'Cloud 9', staffed by College students and opening on Thursday evenings from June. Above. 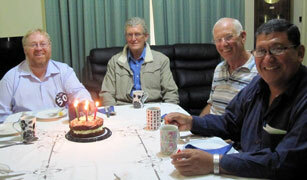 from left: :Baked offerings from the TCC / ... being sampled by appreciative guests; the striking view of Bass Strait from the TCC / exterior view; Burnie/Wynyard's Marist priests, Frs Tony Kennedy and Fred Kado, with Sr Kathlyn O'Brien RSM..
Members of the Marist family gathered on Apr 28 at the General House of the Marist Fathers to celebrate the feast day of their first Saint, proto-martyr of the Pacific and one of Australia's patron Saints, St Peter Chanel. During the liturgy Fr Craig Larkin SM focussed on the respectful and affectionate relationship between Fr Chanel and his confrere on Futuna, Br Marie-Nizier. 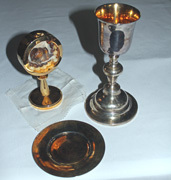 Superior of the Monteverde community, Australian Fr Tony Corcoran, welcomed visiting Marists, inviting them to inspect and venerate a relic of the Saint as well as a chalice and paten used by him. 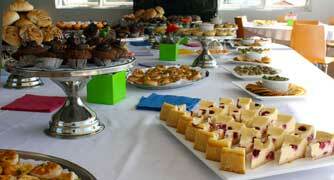 Monteverde's rooftop provided a congenial setting for lunch and 'catching-up' between fellow Marists and other guests. 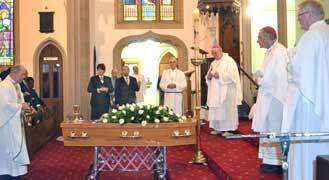 Australia's senior Marist priest, Fr Walter Fingleton SM, was given a solemn farewell at Holy Name of Mary church, Hunters Hill, on Apr 23. Requiem Mass was celebrated by provincial, Fr Paul Cooney SM, Bishops Pat Power and Bernard O'Grady OP and numerous concelebrants. 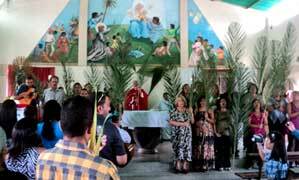 Bougainville presidemt Mr John Momis spoke at the Mass along with Fr Wally's fellow Bougainvillean missionary, Fr John Begg SM. 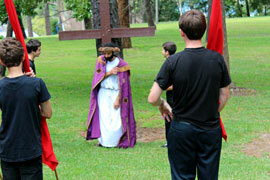 Despite inclement weather, many accompanied the cortege to the missionaries' cemetery in the grounds of Villa Maria. In a ceremony at Sacred Heart cathedral, Suva, Fiji, on Apr 22, two young Marists were ordained deacons for the Oceania Province. 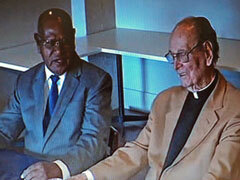 Pictured, left, with their formators / Archbishop Petero Mataca, are Patrick Woria and Richard Harui. 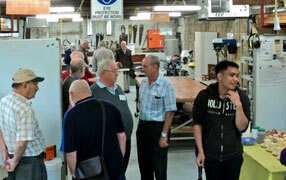 A wet Sydney day did not deter interested handymen from the Hunter's Hill - Ryde district from attending the Open Day for the new 'Mens' Shed' in the grounds of Villa Maria monastery, Hunters Hill. Impressed with the initiative Mary Carey, Executive Officer for Hunter's Hill - Ryde Community Services, thanked the Marist Fathers for their community spirit in allowing the project to be made a reality by providing such a suitable venue for the venture. The historic sandstone building has been renovated and equipped through the hard work and determination of the shed's foundational workers. For the second time in a week Australian Marists mourn the passing of one of their confreres with the death in Fiji of Fr John Bonato SM. Aged 70, and a Marist priest for 46 years, Fr John suffered a stroke on Apr 15 and died early on Apr 18 in Suva Private Hospital. 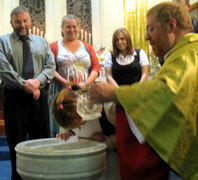 He had received the Last Sacraments and Viaticum from fellow-Australian and provincial, Fr Ben McKenna. A member of the Oceania Marist Province, Fr John was born at Katanning, W.A., and studied at St Peter Chanel's scholasticate, Toongabbie, NSW, where he was a popular community member as organist, choir master and bookbinder. 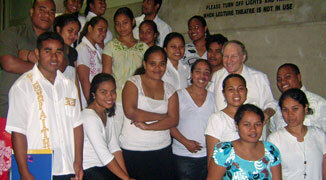 Ordained in 1965 he was to spend most of his priestly life ministering to students and staff at the University of the South Pacific, Suva, Fiji. 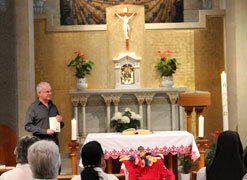 Above: Fr John Bonato with USP students for their regular Sunday Mass. 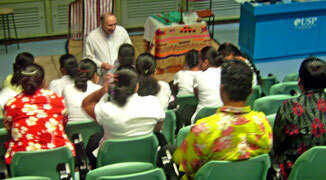 Below: Fr John with USP students at the Laucala campus, Suva. 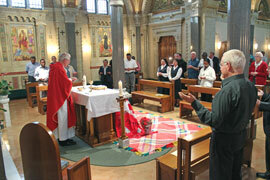 The annual novena to St Peter Chanel for Marist vocations is now available: click here. 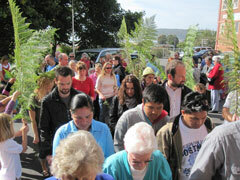 The novena has been prepared by Fr Pat Brophy SM, of the NZ Marist province, now working in Mexico. The nine-day period of prayer traditionally begins on Apr 19 and concludes on Apr 27, the eve of the Feast of St Peter Chanel. 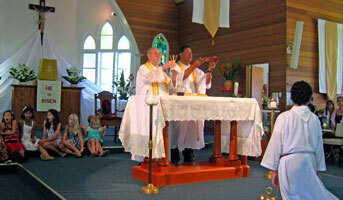 The Marist Saint, protomartyr of the Pacific, is one of Australia's patrons. 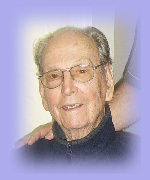 The Australian Province of Marist Fathers mourns the passing at age 97 of its most senior confrere, Fr Wally Fingleton SM, who died in Townsville on Apr 15. One of the pioneering students of Australia's first Marist seminary, Toongabbie, NSW, and brother of cricketing great, Jack Fingleton, Fr Wally was well known for his missionary work in Bougainville. 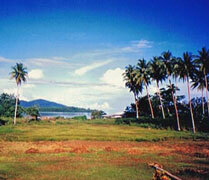 After ordination in 1944 Fr Wally spent several years at St Patrick's, Church Hill, and Woodlawn College, Lismore, before spending a quarter century as a missionary in Bougainville and the Shortland Islands. Returning to Australia with a serious eye condition in 1974 Fr Wally became parish priest of Hunters Hill, NSW, before working again at St Patrick's. 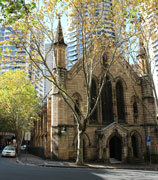 In latter years he looked after a number of country parishes in western NSW, before a well-earned retirement. May he rest in peace. 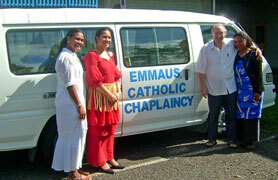 earlier this year with Australian provincial, Fr Paul Cooney; Bougainville, PNG. 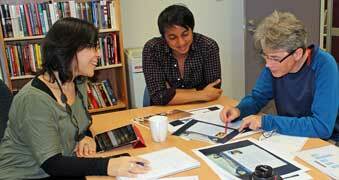 Selina Hasham, Noel Myaing and Vlodek Latanik at Cathcom's office / with web developer, Mark Wei. 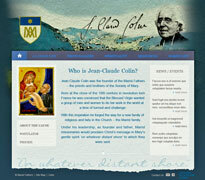 The staff of Sydney Archdiocese's Catholic Communications office have been commissioned to do preliminary work on a website dedicated to Marist Founder, Fr Jean-Claude Colin. 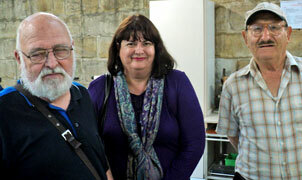 An illustrated text of Fr Colin's life for children is being prepared by talented art student, Noel Myaing. Cathcom manager, Selina Hasham, and graphic designer, Vlodek Latanik, have brought the site planning to a point where Marist authorities in Rome will soon be able to comment and contribute. 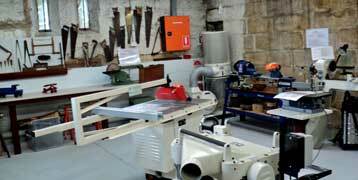 Cathcom's web development staffer, Mark Wei, will soon prepare the site for its 'soft launch'. 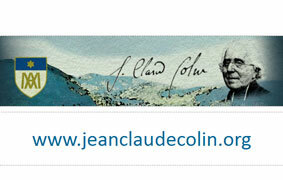 Expressions of interest in the Fr Colin site can be made from the 'holding page' of www.jeanclaudecolin.org. 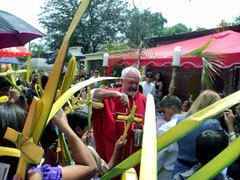 Marist Superior-General, Fr John Hannan, has announced the appointment of Kiwi missionary, Fr Pat Devlin, as the new District Superior of the Marist Mission District of the Philippines and Thailand. Fr Pat, who has recently taken up a support role at the Marist Mission Ranong, southern Thailand, succeeds retiring superior, Fr Hermes Larry Sabud, and will assume his new responsibilities on May 31, 2012. John Honner (left) with pre-chapter committee members, Frs Paul Mahony, Peter McMurrich, Bob Barber and Tony Kennedy. International governance reviewer for the Society of Mary, Mr John Honner, will facilitate the Provincial Chapter of the Australian Province in early July. The pre-chapter committee's meeting on Apr 10 considered how delegates will engage with the governance review process as well as fine-tuning agenda issues. 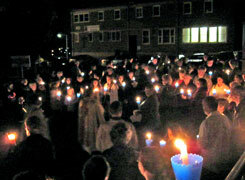 Lay participation, dignity and simple creativity marked liturgies celebrated in four Australian parishes in Marist care over the Sacred Triduum of Easter -- in Gladstone Qld, Hunters Hill and Church Hill, NSW, and Burnie-Wynyard, Tasmania. 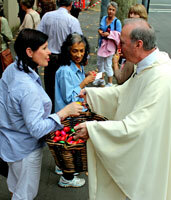 Left: St Patrick's Church Hill parish priest, Fr Ray Chapman, offers Easter eggs to parishioners after Sunday Masses / Good Friday at Star of the Sea, Burnie, Tasmania. Above, Good Friday at Star of the Sea, Gladstone, Qld. 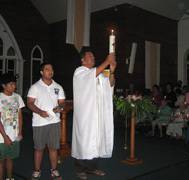 Below: Easter Vigil lights at Burnie, Tas; Fr Aliki Langi and servers, Star of the Sea, Gladstone; Parish priest, Fr Tony Kennedy, baptises at Star of the Sea, Burnie, Tas / Fr Fred Kado at St Brigid's church, Wynyard church, Tas. Above: Easter symbols, from left, St Patrick's, Church Hill, NSW; Star of the Sea, Gladstone, Qld; St Brigid's, Wynyard, Tasmania. 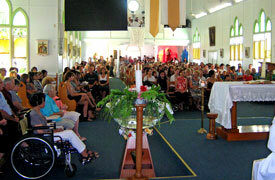 Below: Easter Day Masses at Star of the Sea, Gladstone; St Brigid's, Wynyard, Tasmania. 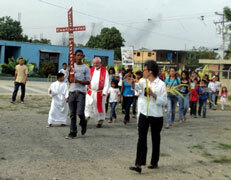 Kiwi Marist missionary, Fr Tony O'Connor, sends images of Passion Sunday processions and liturgies at his Valencia, Venezuela, mission. 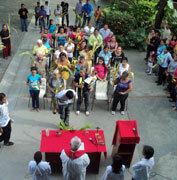 While Fr Tony battles with the never-ending story of limited cash, rising costs of buildings and renovations, the processions and celebrations carry on at St Peter Chanel barrio chapel and Jean-Claude Colin college. 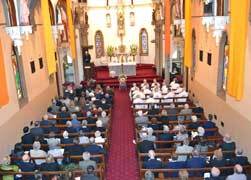 Parishioners of Burnie-Wynyard, Tas, observed Passion Sunday and their parish priest's 50th birthday in a series of rolling celebrations. 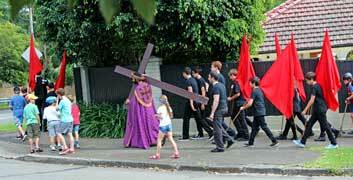 Fr Tony Kennedy (of hot cross bun fame -- see January news) reports varied activities in the N-W Tasmanian parish as Holy Week began, including processions, parties, emergency repairs -- and a catch for assistant pastor, Fr Fred Kado SM. 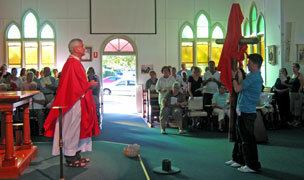 Above: Passion Sunday procession of palms, Star of the Sea church, Burnie; Fr Fred with a Lenten catch / emergency repairs to the sacristy. 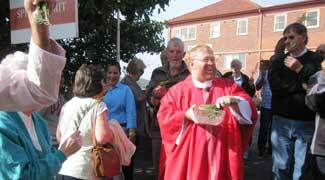 Below: Celebratory morning tea at Yolla church / more partying for Fr Tony. The official icon honouring Marist Founder, Ven Jean-Claude Colin, has now been placed outside the main confessional at St Patrick's downtown city shrine, Church Hill, Sydney. 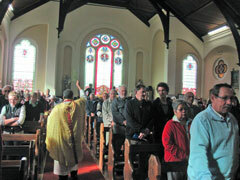 Commenting on the placement parish priest, Fr Ray Chapman SM, reminded parishioners of Fr Colin's insistence that the early Marists should be 'instruments of Divine Mercy'. 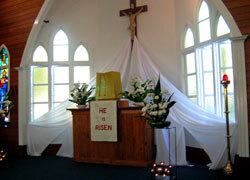 In the days of Holy Week extra periods and staff for Reconciliation are provided. 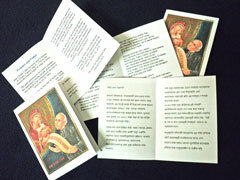 Arabic, Bicolano, Croatian, Dutch, French, Samoan and Tagalog are the latest languages available for the short biography and Beaitification Prayer leaflet for Marist Founder, Fr Jean-Claude Colin. 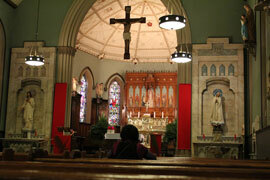 Go to Fr Founder - biography & prayer. See if your first language is thjere. Go to JPIC page. Articles on our Justice, Peace and Integrity of Creation pages are recommended by the Australian Marist Province JPIC Committee.